Minty fresh and oh, so clean! Demineralized water, Sodium laureth sulfate, Cocamide DEA, Fructose, Glycerin, Almond oil, Grape seed oil, Avocado oil, Sesame oil, Safflower oil, Artificial aroma, Sodium benzoate, Citric acid, Vitamin E acetate, Tocopherol acetate, Aspartame. 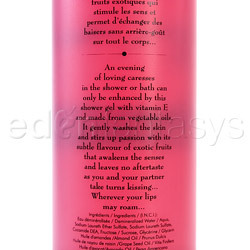 Thank you for viewing Shunga bath and shower gel page!